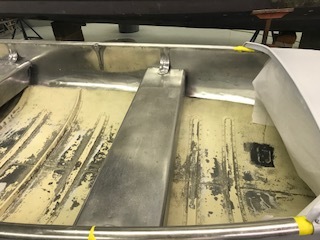 I was hunting in Northern Wisconsin last month and about tripped over this old aluminum boat. Being the curious type, I flipped it over and immediately was taken by the age and the cool lines of the old boat. I contacted the owner and was able to purchase the boat and trailer as well as some other classic "items" from her grandfather's property. Boat and trailer are in process of full restoration while I am at sea. I hope to pick them up in the spring. Trying to identify the trailer. 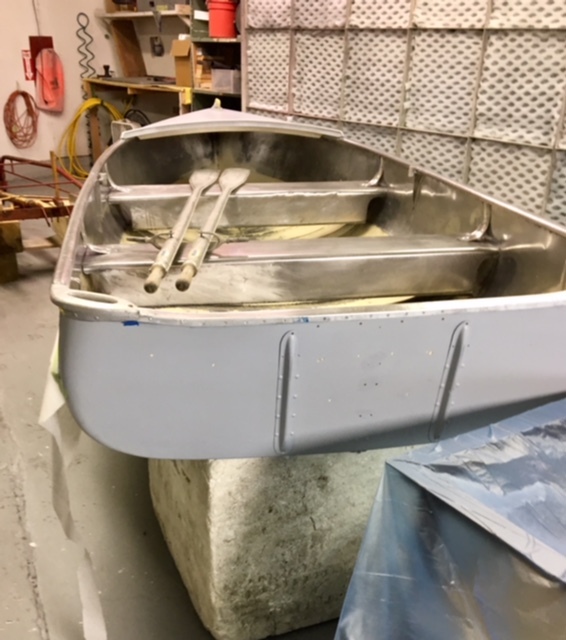 Boat manufacturer says Serial Number 635 R makes it an R model Alumacraft from 1951. 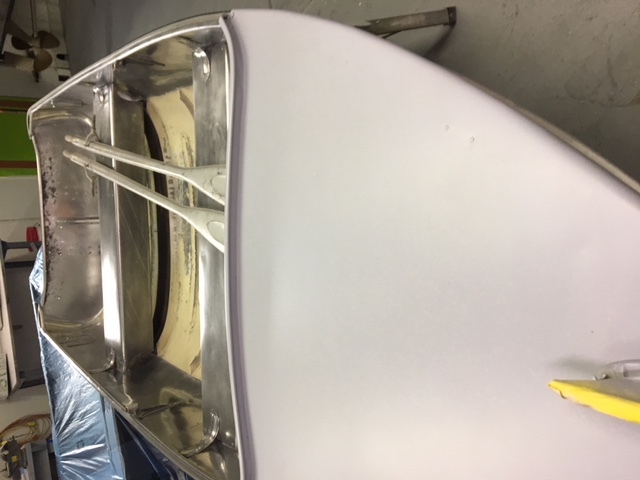 Found Alumacraft Aluminum oars. 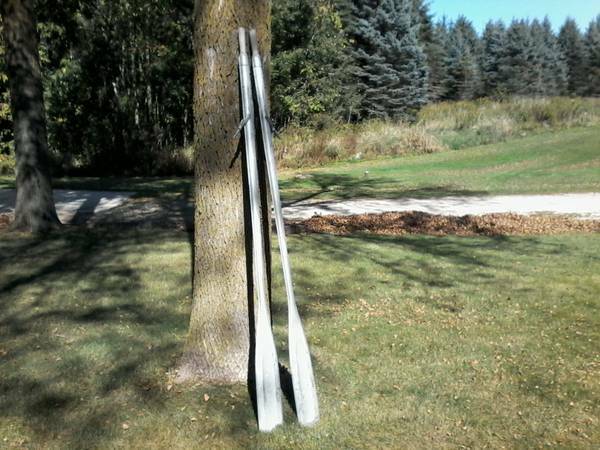 I did some poking around Craigslist and found a pair of correct Alumacraft oars for the old boat. They will be delivered to the restorer today. 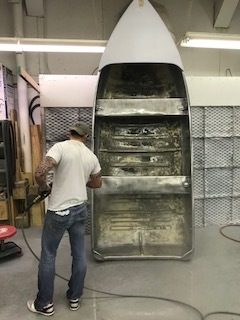 Work continues on old boat. 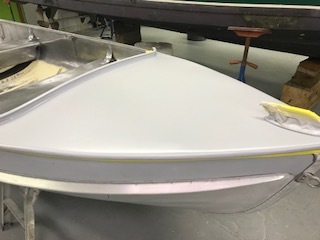 Latest uploads from the boat shop are attached. Update. Aluminum oars delivered. Couple more photos from the day's work. It's bizarre watching the process from a few thousand miles away. Almost like watching it on a TV show but when it's done it going home with me. These fellows do some fantastic work on everything I have brought them. Neat looking project! Keep the pictures coming. Are you going to keep the trailer stock for it? Cool looking little trailer. I like bigger tires, but if your not making long trips the little ones will do. Looks like your restorers are doing good work. I think the trailer stays stock. I can't ever see towing this thing more than a few miles. It will likely live out its days on Washington Island, WI. This project started last year when I went to buy an old car from a guy in Wisconsin. 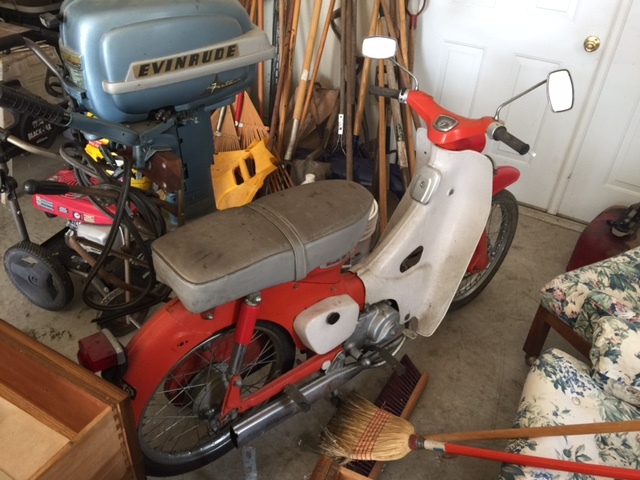 I bought the car but also spied an old outboard and an old scooter in his garage. I bought all of it. A friend says he knows some guys who can make them like new and for a good price. I dropped off both the scooter and outboard and figured I'd give them a shot. Turns out these guys are awesome. 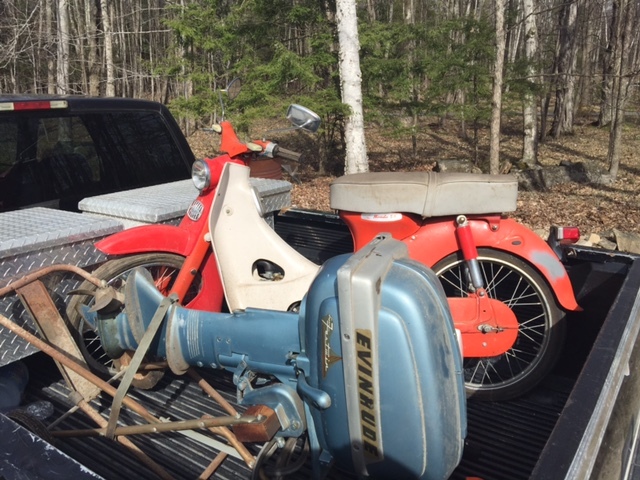 The scooter and outboard look and run like new! 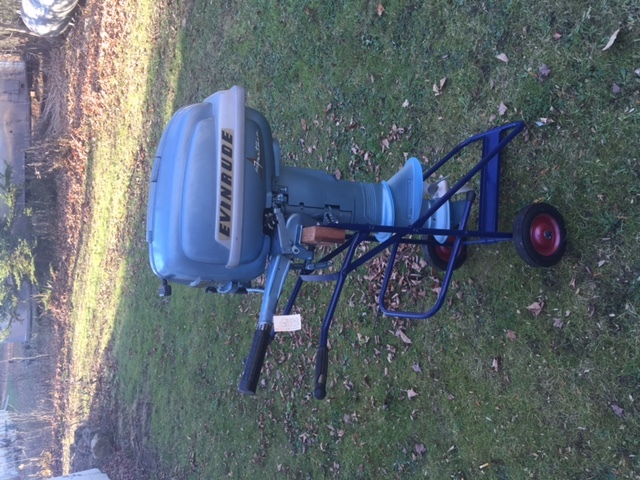 So I wound up with a sweet '50s outboard but no boat to match. Then hunting season rolls around and I about trip over this model R and its trailer in a field. I guess I've had a pretty lucky year for finding cool old things to take home. Awesome story!! Guess I should get back to hunting lol. That motor looks like my DadÃ¢ÂÂs 1955. Ours is a 15hp, but yours looks bigger. Is it like a 22hp? 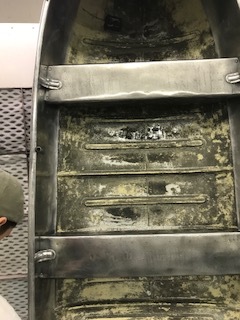 Nice condition on yours. Been to Washington Island, Wisconsin about 5 times and really love that place! Albatrosses burgers are the BEST!! Great finds and will be a very nice rig when done. Thanks for sharing the cool pictures and great story. I think it says FasTwin on the side of the motor which I believe would make it an 18hp. Wonder if it would be a 1959, since our 1955 is a fastwin 15. Seems I remember some 18hp motors late 50s and into early 60s. Our decal is similar, but white behind the word Evinrude. I sure like the sound of our old motor. 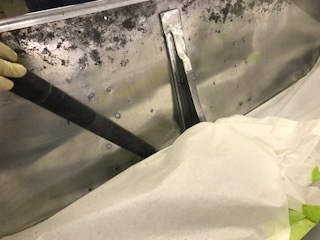 Our model used a sheer pin prop drive... we always had an extra pin taped to the motor loop handle because we river fish and the river dead heads and sunken logs seem to always be moving. 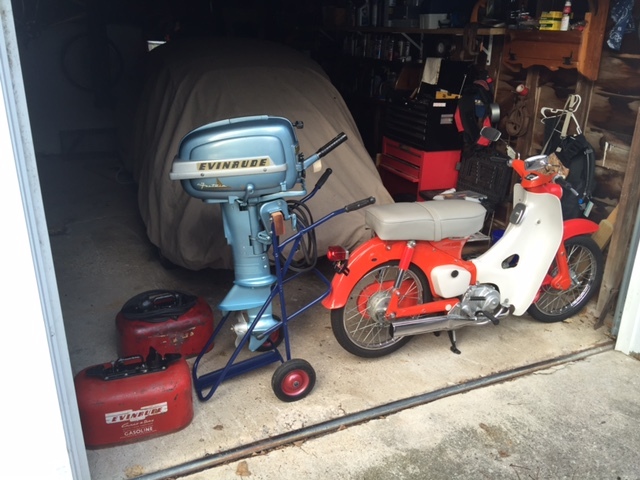 What started as the purchase of a car turned into the purchase of 3 classic cars and then included a classic scooter, and a classic Evinrude outboard all from the same guy. 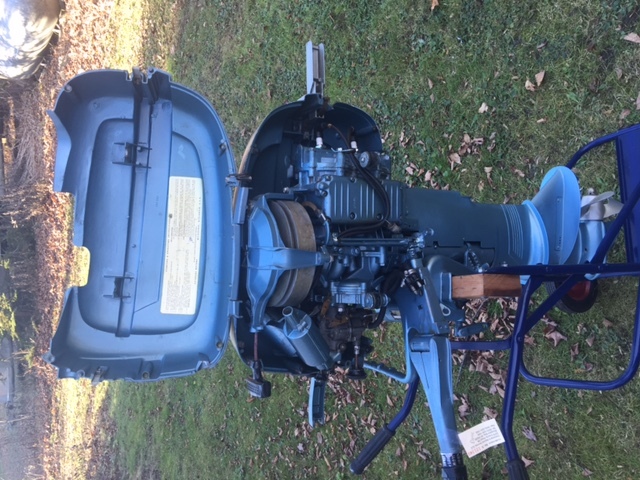 I took the outboard and scooter to some local gents that are well known for their restoration and repair work. 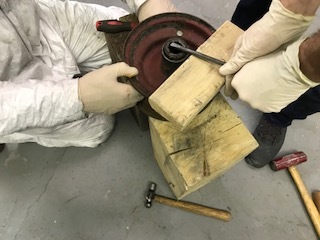 They "cleaned up" the motor, carefully preserving the originality of it. 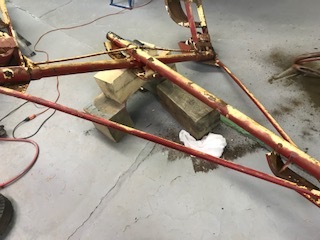 They rebuilt the carb, installed new fuel lines, new ignition coils, spark plugs, repaired the original fuel tank, and refinished the motor stand. They took the motor to a local Evinrude dealer who handled the coil installation and gapping. They estimated that the motor likely has between 2 and 20 hours on it. It is reported to run perfectly. I had it winterized and put it in the basement for safekeeping. It has the markings of a 15hp FasTwin. 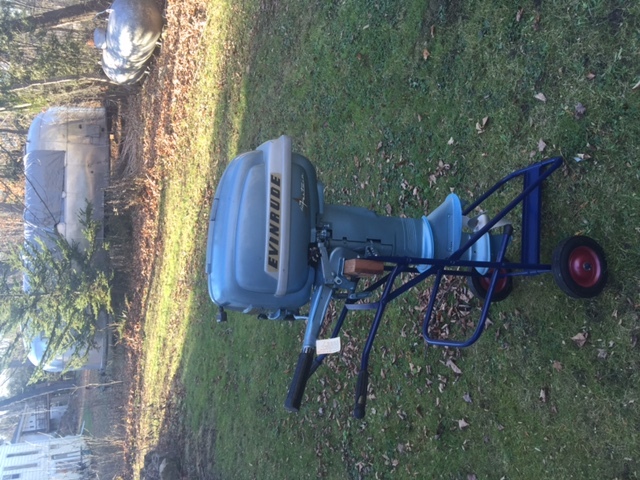 The old time Evinrude expert that worked on it for me says it is a 1954 model. 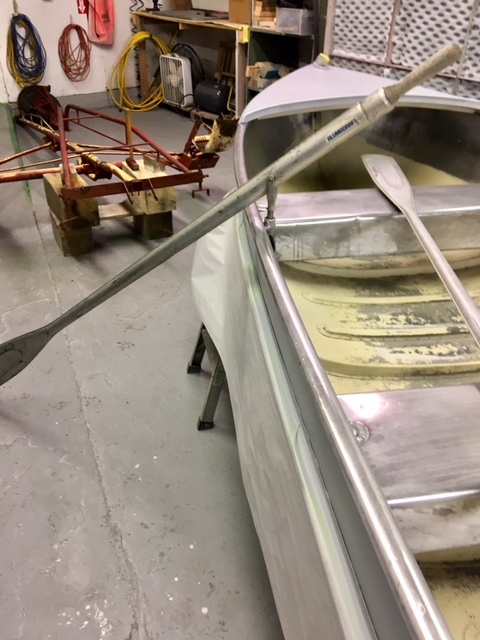 Since I did not have a boat for the old motor, I just planned on filling the cylinders with ATF until the right thing came along. Little did I know that within a week I would find the perfect boat & trailer for the old motor. The purchase of the boat and trailer now includes the purchase of 2 very desirable pickup trucks which were also found on the property with the boat. 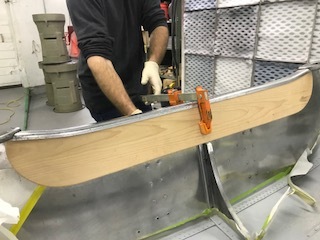 It has been a full month as I am back at work but the fellas in the shop have been hard at it. 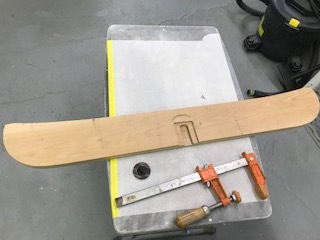 Here are some more pictures of the work. 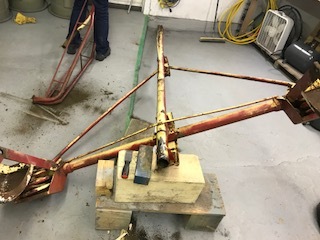 The trailer was disassembled, repaired and put back together. 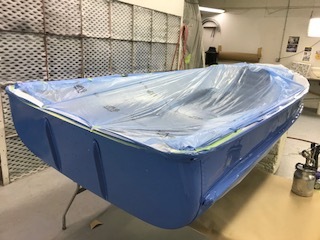 Now blasted, primed, and powdercoated to the original color. 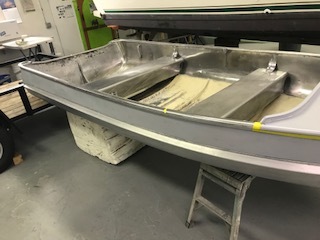 My boat guys are true craftsmen. I appreciate the work they do and can't wait to see the progress. Paint and final assembly are complete. 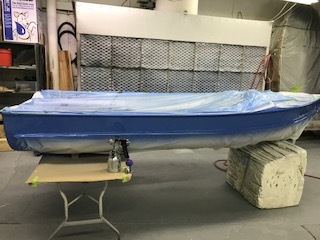 Need to get the motor down to the shop for mounting and rigging but should be fully complete and ready for spring on Europe Lake and Washington Island. Almost ready for the next project and I think I have just the thing lined up for the boys. Wow - great work. I love the mechanical detail of that trailer. Kudos to all who are making your project come together. And if that truck turns out in similar fashion, then they will both be a joy every time they see action. The pictures are awesome! Very nice work on the boat and trailer, looks fantastic!!! I would love to see the Dodge truck when it's completed!!! Somewhere on here is a source for a type of hub that will allow you to install 4 lug hub on this trailer. 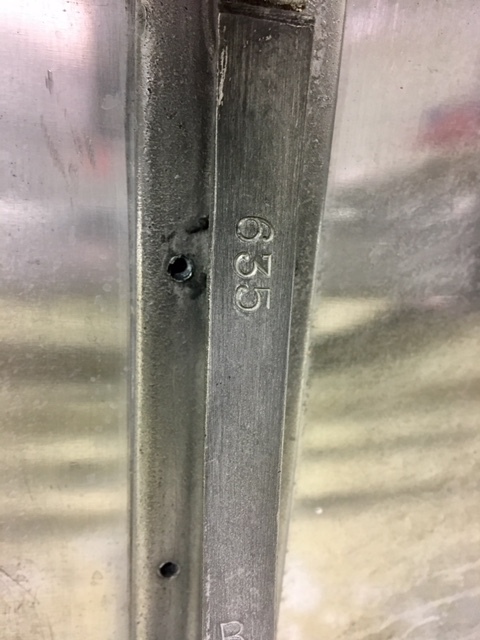 The wheels that are standard have a problem with cracking out around the rims.